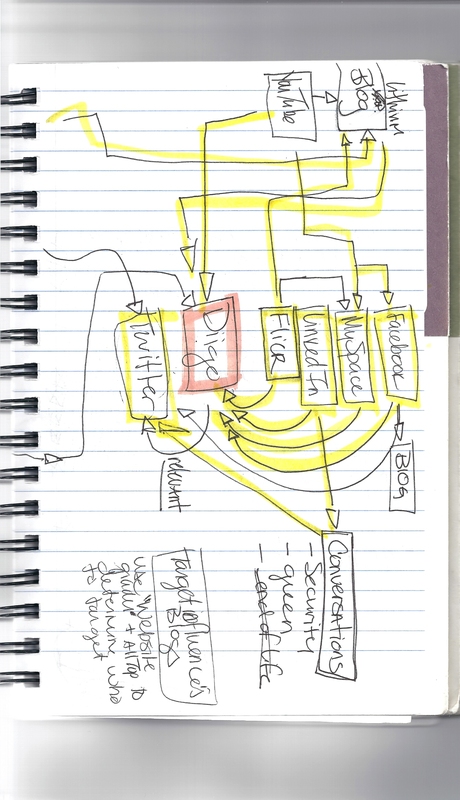 I am preparing for an interview today & ran across Hub Spots Media Diagrams…that they ran across and posted 22 of them in May. 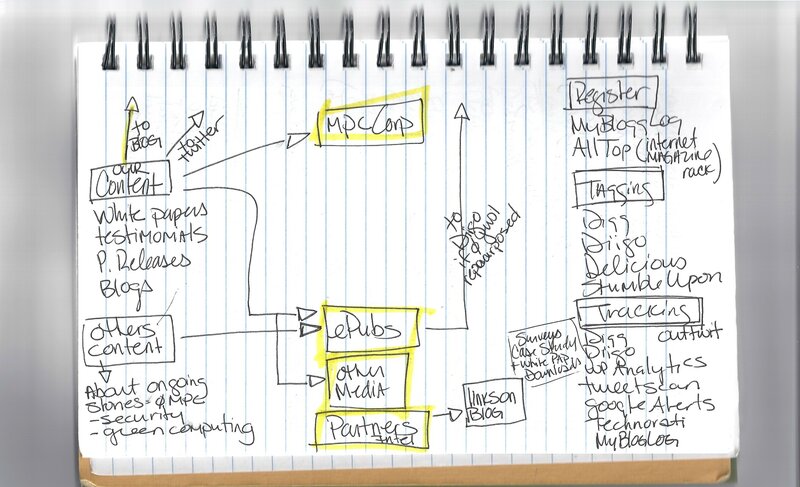 I did this diagram for MPC in October 2008, right before I was laid off (literally days before) and 2 months before they closed their doors. It was a very wide-reaching plan for the company social media plan that I was developing. The plan was rogue since the VP of IT didn’t believe in social media at the time and controlled the website, so this was our plan to go “out there” and make a presence for ourselves based on our new internal bloggers and the success of Michael Boss’ podcasts. It sort of reminds me of looking at my daughters writing two years ago and thinking “whoa, you have come a looong way baby!” But what is funny is that so many SMB’s are not even close to understanding how this non-linear approach works and how it can benefit their pipeline and business bottom line. 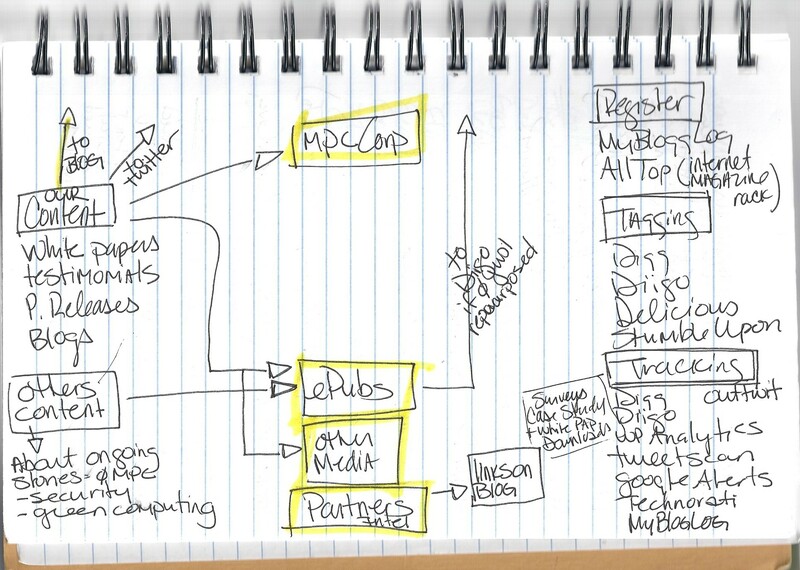 What I find funny two years later is how we avoided the MPC Corporate website so blatantly! Our “go to” web page all landed on Diigo. I would have to conclude that I wasn’t buying into FriendFeed at the time & I was seeing that Diigo was going to give us better SEO feedback. I was obviously throwing “everything” at the wall and hoping that one way would stick. It would have been so cool to ride this out…hopefully I have my chance here soon. If I was a Marketing Director for the Boise Police Department or the Idaho State Police, I would not spend my budget on warning people when, where & what we are going to pull “you” over for. Ummm, didn’t we all take the test when we are 15/16 years old…shouldn’t we KNOW not to drink and drive, or speed in a school zone or tailgate/drive crazy? The PR side of story telling and what happens when people drink & drive etc. is differernt – those are almost scare tactics, you know: Oprah-esque stories that scare us into doing the right thing. My thinking is that if you don’t warn the public where you are going to pull them over (like in the major construction area, on the very well posted 55 MPH freeway) you might just make some more money by getting those that are not “in the know” of the rules that we learned at 15. Wouldn’t that increase the number of tickets and hence the budget for the Police Department where it could be used on training, hiring more officers to catch bad guys and better PR stories? My first PR/Marketing campaign would be reminding people how to use a 4-way stop sign when there are 4 cars. (BTW: the person that is going straight HAS THE RIGHT AWAY, not the person turning)….and when there are only two cars next to each other: yes, the first car to arrive goes first. Takeaway & Question to you: Do you think the Boise Police Department is using their marketing dollars in a responsible way where we are getting the most use & information from it? What would you suggest?